Which Boston Rental Car Is the Best Choice for You? Do you really need a rental car in Boston? Although you can pick up a Boston rental car when you arrive at Logan Airport, you should first ask yourself . . . "Do I really need a car rental for my entire Boston visit?" Boston car rental choices available from the ground transportation area at Logan International Airport include Hertz, Avis, National, Dollar, Budget, Alamo, and Enterprise. If you only need a car for a short time, Zipcar can save you lots of money because you can rent it just for the time when you need it - and no need to pay overnight parking fees. You can easily pick up a Zipcar at many locations in the city whenever you're ready to use it. And don't forget, Boston has very good public transportation options - so you may not need a rental car at all. Do I really need a rental car at all, or can I get around with public transportation? If I do need a rental car, how long to I need it? Can I save money with Find out about Zipcar rentals in Boston? If you're heading out of Boston and not staying in or near the city, reserving a rental car at Logan is a no-brainer - but if you're heading into Boston, a car can quickly become an expensive liability. Although Boston's compact size delights walkers, smallness comes with a price if you're trying to drive. Our streets tend to be narrow and winding, one-way only, blocked by double-parkers, and clogged with jay-walking pedestrians. But that's just the beginning. Our local driving customs include not using turn signals, ignoring red lights, and making random u-turns . . . no excuses, that's just how it is. 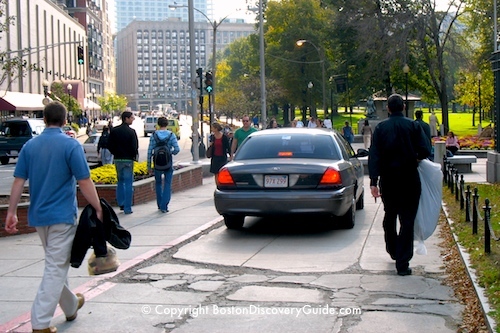 Finding your way around Boston can be more of a challenge than you might expect. GPS does not have a 100% accuracy rate here, and will take you down a 1-way street the wrong way before you know it. 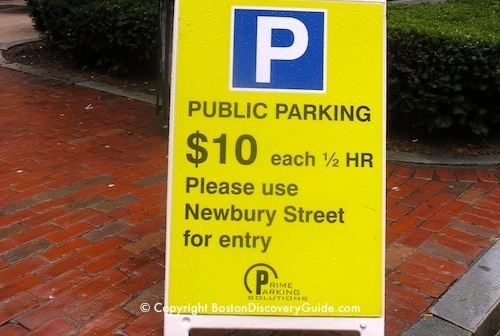 And then there's the cost of city parking: some Boston hotels now charge $50/night or mor (plus tax) to park overnight. Daytime garage rates can be equally shocking. A car quickly becomes an expensive liability - especially if you end up mostly walking while you're here. So before you automatically reserve a Boston rental car for your entire visit, consider taking a water taxi or regular taxi to your hotel from the airport, and renting a car only for whatever time you need one. You'll save a lot of money - and avoid a lot of stress. Don't be fooled . . . read the fine print . . . that's $10 for every HALF HOUR of parking! The fastest and most scenic way to get from Logan International Airport to Downtown Boston, the South Boston Waterfront, Charlestown, or the North End is by water. Boston water taxis make the trip in about 7-10 minutes, and operate in all but the most severe weather conditions. Water taxis work well if you can manage your own luggage, and if your hotel is within a short walk from the wharf. If not, you can take the Boston subway's Silver Line to South Station and transfer to another line if necessary. You can also take a land taxi from the airport to your hotel. There are certainly times when you may need a Boston rental car during your visit. Perhaps you want to attend an event outside of the city, such as a New England Patriots game or concert at Gillette Stadium, or enjoy a day of power shopping at Wrentham Outlets, or visit Plimouth Plantation on Boston's South Shore. The good news is that you can easily arrange a Boston car rental for just the period of time when you need it. Zipcar is the easiest and usually the cheapest option. Another advantage is that if you're staying in or near the city, you'll usually find a pickup location nearby, including at many hotels. You rent by the hour, and pay for only the time you actually need. Usually you can get slightly lower car rental rates outside of the airport, but that may not be convenient, especially if you have to get there by taxi. A few Boston luxury hotels provide complimentary in-town car services, ranging from plush sedans to green hybrids. Depending on what you need, this may work well for you - plus you'll get to stay in one of Boston's best hotels. Reserve a Boston rental car for your entire stay only if you really need one! Otherwise, rent a car just for the hours or days when you actually need it. If in-town transport is all you need, consider a luxury hotel that throws this in for free - or use public transportation. You'll save a bundle on car rental fees, taxes, insurance, and parking fees by renting a car for only the time that you need it - and you use the money you saved for a wonderful meal in a Boston restaurant.